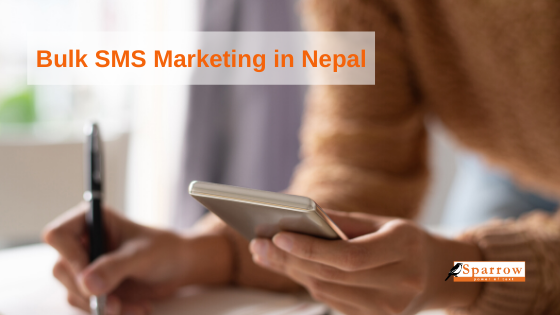 Bulk SMS Marketing in Nepal – effortless yet beneficial! How Bulk SMS Marketing saves your time and money? When you hear the word “Marketing”, the first thought that comes to your mind is rigorous, such as, big hoardings, heaps of pamphlets, announcements, advertising, publicity, and lots of…expenditure. The main reason for this is that people have a wrong notation on marketing. They think marketing can only be done on a large scale, encompassing great audience. It is not necessary to be your marketing loud and huge for its effectiveness. It can be simple yet effective too. Bulk SMS marketing is a simple, effective and affordable form of marketing tool that lets you market your business convey to the targeted potential customers without using any loud and expensive modes of advertising. You will get a better result from SMS Marketing as it let you send messages only to targeted people rather than forcing the product on the public. So, you can only send marketing text to only those who might actually be interested in product purchase. Mobile is the personal device which is too close to your customers so, they will not ignore your message. Instead, they will read the message as soon as they switch on their phones but in the case of hoardings and pamphlets, there are high chances of ignorance. SMS marketing hence results in instant delivery of information about the product/services. SMS marketing lets you send the information in short with the use of striking phrases like offer, discount, sale, save, and so on. Making your marketing text message short and to the point will reduce the boredom and readers can grab the intentional messages quickly. Businesses should send SMS excluding unneeded details about the product. People are encouraged to participate in the marketing process by making use of two-way communication with the help of keyword and short code SMS service. This is beneficial to collect feedback, surveys, contests, and any other SMS marketing campaign. Customers will be desperately waiting after their order. A delay in the delivery can make a huge difference for them. To solve this, customers can be informed about the status and update of their product delivery. Try these effortless marketing tactics for your business too! Get a free demo account with 10 free credits! Or, Talk to our SMS Experts, Call/Whatsapp, 9802005007/08. How Many Characters can Plain Text & Unicode SMS Contain?